Use this page to make default setting selections. Alternately, you can adjust settings on individual workstations through the Contributions Application settings. •Days Back – Enter the number of days back from the current day occurrences should display, if taking attendance at time of contribution processing. •Process Attendance – Set to true if marking attendance at time of contribution processing. Attendance is marked for the individual contributor. •MICR Comm Port – You can optionally specify the communication port for the check scanner that should be automatically detected. •Temp Image Path – Temporary directory file path where scanned images are stored. Default location is the Image Cache folder. •Allow Importing – If using Shelby Teller, set to True to import scanned batches. •Batch Label Lookup Type – Use this option to specify a different Lookup Type to use for batch labels. 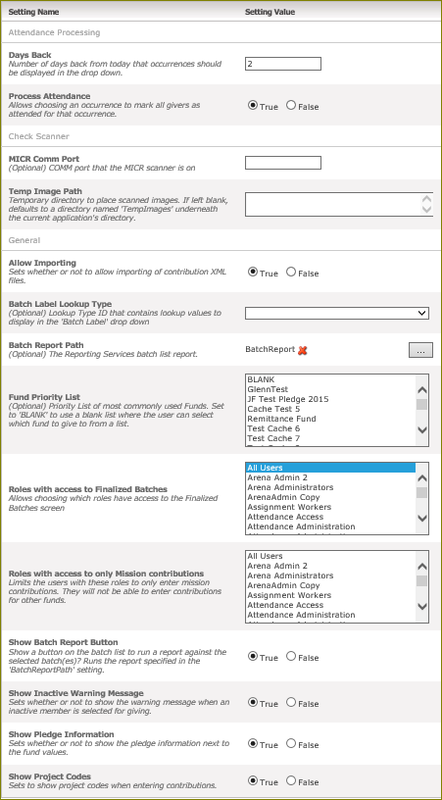 •Batch Report Path – Use this option to select the batch report if different from the default. •Fund Priority List – Select the funds that should be available by default for all users. Users can also select funds to be available. All other active funds display in a drop-down list. •Roles with access to Finalized Batches – Select security roles of users who should have access to finalized batches. •Roles with access to only Mission contributions - Select security roles of users who can process mission traveler contributions. •Show Batch Report Button – Select Yes to display batch report button. •Show Inactive Warning Message - Select Yes to display inactive warning message when selecting an inactive record. •Show Pledge Information – Select Yes to display pledge information. •Show Project Codes – Select Yes to display project codes.